A silent, candlelit vigil on the eve of the arms fair in solidarity with victims of the arms trade. Bring signs, banners, candles and jars – this is a very windy area! Open to all. Meet at 6:30 pm on Tidal Basin Road near the Royal Victoria Docklands Light Railway station to walk to the ExCel Centre. The vigil will take place between 7 pm and 8 pm. 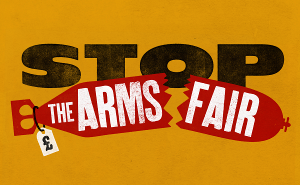 Organised by East London Against the Arms Fair (ELAAF), Pax Christi, Quaker Peace and Social Witness (QPSW) and Campaign Against Arms Trade (CAAT). For more information, contact Pat Gaffney of Pax Christi on 020 8203 4884. Young Quakers are particularly welcome at this event and staff from the Children and Young People’s team of Quaker life will be on hand.